For the historic site, see Pea Ridge National Military Park. 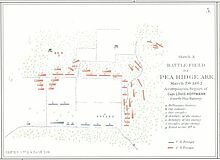 The Battle of Pea Ridge (March 7 – 8, 1862), also known as the Battle of Elkhorn Tavern, was a major battle of the American Civil War fought near Leetown, northeast of Fayetteville, Arkansas. Federal forces, led by Brig. Gen. Samuel R. Curtis, moved south from central Missouri, driving Confederate forces into northwestern Arkansas. Maj. Gen. Earl Van Dorn launched a Confederate counter-offensive, hoping to recapture northern Arkansas and Missouri. Curtis held off the Confederate attack on the first day and drove Van Dorn's force off the battlefield on the second. This American Civil War battle was one of the few in which a Confederate army outnumbered its opponent. By defeating the Confederates, the Union forces essentially established Federal control of most of Missouri and northern Arkansas. They had more battles to fight in southern Arkansas. United States forces in Missouri during the latter part of 1861 and early 1862 had pushed the Confederate Missouri State Guard under Major-General Sterling Price out of the state. By spring 1862, Federal Brig. Gen. Samuel R. Curtis determined to pursue the Confederates into Arkansas with his Army of the Southwest. Curtis moved his approximately 10,250 Federal soldiers and 50 artillery pieces into Benton County, Arkansas, and along Little Sugar Creek. The Federal forces consisted primarily of soldiers from Iowa, Indiana, Illinois, Missouri, and Ohio. Over half of the Union soldiers were German immigrants, grouped into the 1st and 2nd Divisions, which were under the command of Brig. Gen. Franz Sigel, a German immigrant who expected to command the army forces into Arkansas. Upon learning that General Curtis was appointed in command, Sigel threatened to resign. The predominantly native-born regiments were assigned to the 3rd and 4th divisions in order to create an ethnic balance among divisions and their commanders. Due to the length of Curtis's supply lines and a lack of the reinforcements needed for a further advance, Curtis decided to remain in position. He fortified an excellent defensive line on the north side of the creek, placing artillery for an expected Confederate assault from the south. The Confederate major general, Earl Van Dorn, had been appointed as the overall commander of the Trans-Mississippi District to quell a simmering conflict between the Confederate generals Sterling Price of Missouri and Benjamin McCulloch of Texas. Van Dorn's Trans-Mississippi District totaled approximately 16,000 men, which included 800 Indian troops, Price's Missouri State Guard contingents and other Missouri units, and McCulloch's contingent of cavalry, infantry, and artillery from Texas, Arkansas, Louisiana, and Missouri. Van Dorn was aware of the Federal movements into Arkansas and was intent on destroying Curtis's Army of the Southwest and reopening the gateway into Missouri. He intended to flank Curtis and attack his rear, forcing Curtis to retreat north or be encircled and destroyed. Van Dorn had ordered his army to travel light so each soldier carried only three days' rations, forty rounds of ammunition, and a blanket. Each division was allowed an ammunition train and an additional day of rations. All other supplies, including tents and cooking utensils, were to be left behind. On March 4, 1862, instead of attacking Curtis's position head on, Van Dorn split his army into two divisions under Price and McCulloch, ordering a march north along the Bentonville Detour to get behind Curtis and cut his lines of communication. For speed, Van Dorn left his supply trains behind, which proved a crucial decision. Amid a freezing storm, the Confederates made a three-day forced march from Fayetteville through Elm Springs and Osage Spring to Bentonville, arriving stretched out along the road, hungry and tired. Warned by scouts and Arkansas unionists, Curtis rapidly concentrated his outlying units behind Little Sugar Creek, placing William Vandever's 700-man brigade, who marched 42 miles (68 km) in 16 hours from Huntsville to Little Sugar Creek. But Curtis's right flank also suffered from Sigel's having sent a 360-man task force to the west, where they would miss the next three days of fighting. Sigel also withdrew a cavalry patrol from the road on which the Confederate army was advancing; however, Colonel Frederick Schaefer of the 2nd Missouri Infantry, on his own initiative, extended his patrols to cover the gap. When Van Dorn's advance guard blundered into one of these patrols near Elm Springs, the Federals were alerted. Still, Sigel was so slow in evacuating Bentonville that his rear guard was nearly snared by Van Dorn on March 6 as he advanced. Waiting until the Confederate advance was nearly upon him, Sigel ordered his 600 men and six guns to fall back on a road leading northeast toward Curtis's position. The Confederate 1st Missouri Cavalry led by Elijah Gates attacked from the south to cut off Sigel's retreat. They managed to surprise and capture a company of the 36th Illinois, but many were freed when Sigel's withdrawing men unexpectedly bumped into them. Sigel managed to fight his way through Gates' men, helped by a blunder by confederate Brig. Gen. James M. McIntosh. McIntosh had planned to envelop Sigel's force from the northwest while Gates closed the trap on the south. However, McIntosh mistakenly took his 3,000-man cavalry brigade too far up a northerly road. After marching three miles out of his way, he turned his troopers onto the road leading east into the Little Sugar Creek valley. By the time they reached the site where Sigel's northeast road met McIntosh's east-bound road, the Federal general's men had already passed the intersection thus avoiding a disaster. When the 3rd Texas Cavalry charged, they ran smack into Sigel's main line. The Confederates lost 10 killed and about 20 wounded to Federal artillery and rifle fire and the Union position held. On the night of March 6, Col. Grenville Dodge, with Curtis's approval, led several parties to obstruct the Bentonville Detour, felling trees on the road between Twelve Corner Church and Cross Timber Hollow. That same evening, Van Dorn's army, Price's Division leading, began the long march to Cross Timber Hollow. The night march was slowed by clearing Dodge's obstructions, Van Dorn's lack of an engineer corps, poor staff work, and the soldiers' exhaustion. With his victory, Curtis sent some of his troops east of the Mississippi and proceeded with the remainder of his army to move east to West Plains, Missouri. Then he turned south into undefended northeast Arkansas. He had hopes of capturing Little Rock, but this proved impossible because of a lack of supplies and because guerrillas had cut his supply lines. Instead, following the approximate course of the White River, Curtis continued south and seized Helena, Arkansas, on July 12. Van Dorn ignored logistics and failed to control his army. When McCulloch was killed, his division fell apart while Van Dorn absorbed himself in the tactical details of Price's fight. His staff lost contact with his wagon train at a critical moment and committed many other errors. Of all the Southern officers, Henry Little showed the most ability, becoming the "de facto commander of Price's division" at the end of the battle. The battlefield at Pea Ridge is now Pea Ridge National Military Park, founded in 1956, one of the best-preserved civil war battlefields. A reconstruction of Elkhorn Tavern, scene of the heaviest fighting, stands at the original location. The park also includes a 2.5-mile (4.0 km) section of the Trail of Tears. ^ a b Shea 1997, p. 270. ^ Shea 1997, pp. 270–71. ^ Shea 1997, p. 271. ^ Josephy 1991, pp. 337–38. ^ Shea 1997, p. 8–9, 14. ^ Josephy 1991, p. 338. ^ Shea 1997, pp. 20, 59. ^ Shea 1997, pp. 56–58. ^ Shea 1997, pp. 62–65. ^ Shea 1997, pp. 66–67. ^ Shea 1997, pp. 68–69. ^ Shea 1997, pp. 69, 74–76. ^ Shea 1997, p. 77. ^ Shea 1997, pp. 67–68. ^ Shea 1997, pp. 80–84. ^ Shea 1997, pp. 82, 84. ^ Josephy 1991, pp. 341–42. ^ Shea 1997, pp. 90, 151. ^ Shea 1997, pp. 334–36. ^ Shea 1997, p. 95. ^ Shea 1997, p. 102. ^ Shea 1997, pp. 94–96, 107, 109. ^ Shea 1997, pp. 110, 113–15, 118–19. ^ Shea 1997, p. 141. ^ Shea 1997, pp. 120–40. ^ Shea 1997, pp. 143–46. ^ Shea 1997, p. 154. ^ Shea 1997, pp. 158–67. ^ Shea 1997, p. 181. ^ Shea 1997, pp. 171, 180–83. ^ Shea 1997, pp. 185–205. ^ Shea 1997, pp. 216–22. ^ Shea 1997, pp. 210, 214. ^ Shea 1997, pp. 225–28. ^ Shea 1997, p. 239. ^ Shea 1997, pp. 230–36. ^ Shea 1997, p. 236. ^ Shea 1997, pp. 235–42. ^ Shea 1997, pp. 243–47. ^ Shea 1997, p. 257. ^ Shea 1997, pp. 257–58. ^ Shea 1997, pp. 205, 270. ^ Shea 1997, pp. 270–71, 334–36. ^ Josephy 1991, p. 347. ^ Josephy 1991, pp. 346–47. ^ Josephy 1991, p. 348. ^ "People". National Park Service. Retrieved September 4, 2016. ^ Shea 1997, p. 311. ^ Shea 1997, pp. 310–11. ^ Shea 1997, pp. 312–13. ^ Shea 1997, pp. 329–30. Josephy, Alvin M., Jr. (1991). The Civil War in the American West. New York: Alfred K. Knopf. ISBN 0-394-56482-0. Shea, William L. (1997). Pea Ridge: Civil War Campaign in the West. Chapel Hill, NC: University of North Carolina Press. ISBN 978-0-8078-6976-5.